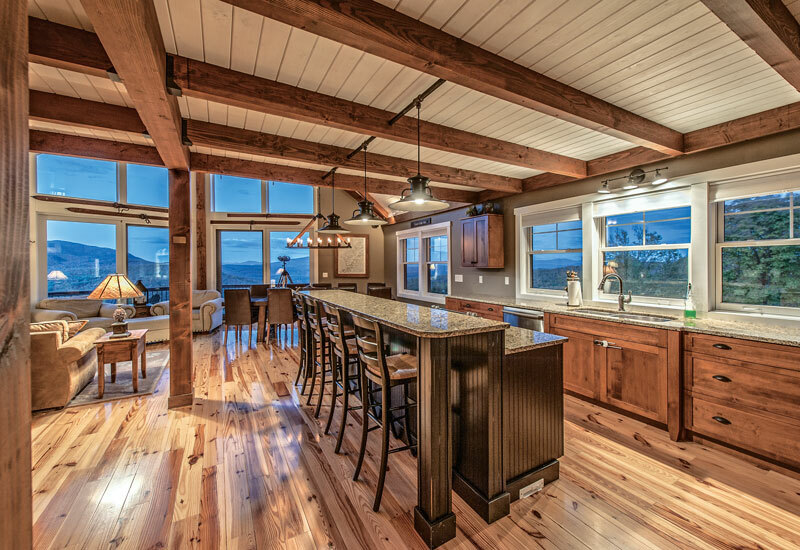 Get ideas for cutting costs while planning and designing your timber frame kitchen. Even if your idea of an elaborate meal is a frozen lasagna paired with a young boxed wine, you still probably have fantasies of the perfect kitchen. There’s something so alluring about the kitchen: the place where both Thanksgiving meals and science-fair projects are concocted. So it’s understandable that you’ll want to get the most bang for your buck in that room, even if the most often-used appliance is the microwave. And you’re in luck. According to designers, the kitchen is the easiest place to cook up a budget compromise. Read on for some clever ways to limit your costs, yet create a kitchen that lives up to your expectations and then some. Keep in mind that the total cost of your kitchen should be between 5 and 15 percent of your total construction costs. If you spend less or more than that, you may not get a good return on your investment if you ever need to re-sell your timber frame home. Of your kitchen budget, your cabinetry should account for about 50 percent of the total cost. There are plenty of simple, do-it-yourself projects when it comes to finishing a kitchen. Tiling a backsplash is relatively easy, as is tiling countertops. Hooking up appliances yourself can save you the installation costs. And try a dummy-proof faux finish or stencil on drywalled surfaces to impart some personality in your kitchen. Instead of going with pricey ceiling detailing in your kitchen, install ceiling-mounted racks to hang copper pots. The pots’ golden-auburn color will fill your kitchen with a warm glow and add textural interest. But make sure you get pots coated with permanent varnish so they don't have to be constantly polished. Before you begin construction, ask yourself: What is essential for a useable kitchen? What can be put off until later? What can you do without? A prominent kitchen designer from SEN Design Group suggests a two-phase building plan. In Phase 1, install base cabinets without accessories, like crown molding or built-in organizers. Phase 2, to be constructed when your budget permits, includes add-ons and upgrades, such as roll-out shelves, tray dividers, utensil dividers, and double garbage inserts that will make your kitchen uniquely your own. Need extra burners? Including a wood-burning stove in your kitchen plans—one with two ovens and several top burners—can be less expensive than installing a top-of-the-line six-burner stove and a double wall oven. Plus, you’ll get the added benefit of the cozy ambiance a wood-burning stove provides. Adding an outdoor kitchen or a patio cooking station is great for entertaining and allows the resident chef to still be a part of the party. However, before committing to this expensive add-on, consider your climate. If you’re building a second home in an area where winters are long and snows are heavy, you’ll probably only use the outdoor cooking area eight to 10 times a year. Plan to build a single hearth wall for back-to-back fireplaces in the kitchen and an adjoining dining room or great room. The most economical such design utilizes a “see-thru” unit, which is simply a fireplace that opens both in front and in back. Another option is to build two separate fireplaces with two separate flues (exhaust vents), but a common chimney and wall. Buying regular appliances instead of going pro can help keep lower costs, but so can shopping around. Discount stores, such as those operated by Habitat For Humanity, sell building items donated by major home supply chains, contractors, demolition crews and individuals for a fraction of their normal prices. Go to www.habitat.org and click on “Restores” to save money, while also helping fund the construction of Habitat houses within your community. It pays to compare floorplans. Stacking a main-level kitchen beneath a second story bath is the most cost-efficient arrangement, since your plumber won’t have to run water lines all over your house. The money you save on plumbing systems can be used for more visible and glamorous items. In creating your dream kitchen, size does matter—but bigger isn’t always better. A smaller footprint with an efficient work triangle will allow you to splurge on details and upgrades that will have a much greater impact on your guests than a cavernous space with nothing in it but basic items. ‘Decorative laminated veneer’ (DLV) doors look like solid wood but cost far less. Ronnie suggests checking out cabinetmaker UltraCraft’s Vision series and Amero Cabinet Collection’s Nouveau style by Pacific Crest Industries. “You’ll be amazed how the DLV process mimics the look of real wood,” he says. Choose cabinets with a rich wood-color stain instead of a glazed, painted or distressed finish. These premium finishes not only add detailing, they also add 15 to 35 percent to the cost of the cabinetry, according to Nancy Woodka, a designer at Columbine Kitchen and Bath in Castle Rock, Colorado, and a member of the SEN Design Group. Center islands provide a work surface for food preparation, serving and dining—and serve as the heart of your kitchen. Consider using a salvaged item as its base, such as a wooden shop counter. Browse local architectural salvage shops, antique stores and even flea markets for inspiration. By using a reclaimed element, you’ll save money and help the environment, while creating a unique look for your home. If your heart is set on granite or marble countertops, think about using those surfaces only on the kitchen island or other work surface that’s front and center. Opt for a countertop with a similar look but a lower price tag for the surrounding counters. Susan Lund, of AKBD Spacial Design, another member of the SEN Design Group, likes Silestone and Staron, which are both solid-surface counters mixed with quartz for a realistic stone look. “These surfaces cost from 10 to 40 percent less than natural stone while still giving your kitchen that sleek, sophisticated look,” she confides. An added benefit is that they are solid surface and require less maintenance. Replacing some or all of your wall-mounted cabinets with open shelves is an inexpensive way to add aesthetics and function to your kitchen, says Joanne Kellar Bouknight, author of Taunton Homes’ New Kitchen Idea Book. Use open shelves to store your best-looking pots and pans; baskets to conceal everyday gadgets; and decorative glass jars to hold pantry staples, like flour and coffee. Like wood vinyl flooring. Get Floored. Considering hardwood floors in the kitchen? Joanne suggests using top-of-the-line vinyl that mimics plank flooring. “High-priced vinyl is still a lot less expensive than most other flooring,” she advises. Plus, it’s a more durable option for high-moisture areas than wood flooring would be. You might think you don’t need a pantry, but if you’ve got the space, that little closet could be a storage godsend. With just the cost of some inexpensive shelving, a pantry could eliminate the need for a whole bank of pricey cabinets. Just make sure it’s adjacent to your prep area so it’s convenient to access. An easy way to blow your budget? Making alterations in the midst of construction. Be sure that you’re entirely happy with your floorplan, cabinets, appliances and finishing materials before it starts coming together to avoid pricey change fees. If you’d prefer genuine stone instead of solid-surface options, you may still be able to afford it on a shoestring budget. Some people use dark granite tile with black grout to finish their countertops. “From far away, you can’t tell that it’s not one slab,” Matthew says. Think long and hard before selecting major items (counters, faucets, cabinets) in a bold color. In addition for paying a premium for designer colors, keep in mind that timber frame homes are classic; so what’s trendy right now in hues might be dated in a few years. If you want to play up an of-the-moment color in your kitchen, use if for accents that are easy and inexpensive to swap, like drawer pulls or a window valence.